Referrals from alumni and families make a difference. Once a prospective student is referred, one in five of them apply. Over the past four years, nearly 300 students are at Hope because they first connected through a referral from someone like you. With more than 3,500 colleges and universities in the United States alone, what makes Hope such a unique option? Well, let’s start with three words: mind, body and spirit. These are the anchors of the Hope experience. Before you reach out to the prospective Hope students in your life, brush up on why there’s never been a better time to consider Hope College. Students from around the world that are currently sophomores and juniors in high school and have demonstrated leadership, service and academic performance are great candidates for a referral. We seek students who will bring a wide range of perspectives and gifts to enrich our campus community. Though admission is selective, we’ll give each completed application careful consideration and review for factors that signal future academic and social success. Invite them to attend a Visit Day on campus or schedule an individual visit or overnight visit. Suggest their family vacation in West Michigan and add a stop on campus to their itinerary. Suggest they check out the fly-in program or the business, nursing or health professions showcase events. Don’t be afraid to brag. For some help, read up on recent ranking and recognitions. For those that express interest, don’t forget to suggest they apply. Other items like contact information, date of birth, GPA and academic interests are not required, but are helpful if you have them. The Hope College admissions team will follow up with individual attention to the student you recommended. You’ll receive an email from Hope confirming your referral, and we will follow up with the student encouraging them to apply to Hope. 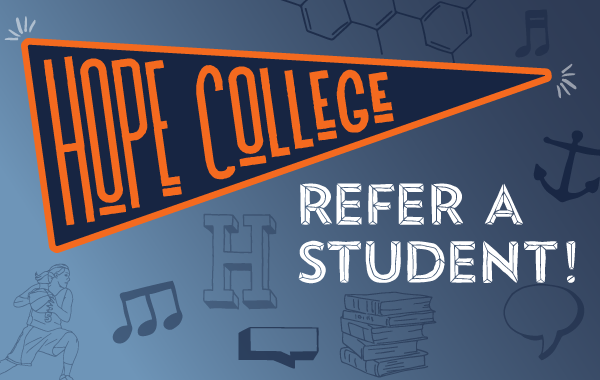 As a thank you for referring a student you will receive a coupon code for $10 off a purchase of $40 or more to the Hope College Bookstore.